We issue a warm invitation to all members to participate in any interest group. Unique opportunities for friendship, sharing, and learning are offered. The only requirement for participation is paid membership in The University League. Click on any interest group below for more information, including meeting times, organizer contact, and a brief description of the activities. The University League Aerobics Group is about far more than aerobics. This group of approximately 15 women share laughter and friendship as we bond every Monday and Thursday from 8:00 to 9:30 AM at Madtown Twisters‘ on Old Sauk Road. We warm up with a fun aerobics dance routine, then become more and more flexible by doing yoga, lift some weights, do some core work, and end with stretching. This total workout brightens up the day. Once a month we go out for coffee after we’re done with our fitness routine. Engaging talks on various aspects of collecting antiques. Meetings at members’ homes, local libraries, and antique venues, as well as some out-of-town trips. Learn about places to travel with little effort on your part, the foods of the country or area, ways to travel (rail, barge), the ins and outs of safe, low-stress travel and the unique culture of places within the US and other countries. We meet at Oakwood West, Nakoma Room. Everyone is welcome! Topics and speakers are developed over the summer. Appreciation of art developed by visits to galleries, museums, private collections, and slide lectures. Walk different trails—observe birds and habitats. Meet at the far end of the parking lot at Covenant Presbyterian Church at the corner of Segoe Road and Mineral Point Road. The group selects nine books to read throughout the year in July. A member reviews a book each month, followed by a general discussion. Meet in members’ homes or at Oakwood West. Members read an assigned book prior to attending meeting. Following coffee and dessert, a group member leads the discussion and all members actively participate. Meet in members’ homes. Eight books are read each year. May is a luncheon and September is a summer recap as well as a light-read book to discuss. Play in members’ homes. Light refreshments are served by hostess. Following lunch served in Oakwood West Village Inn, paid for by bridge players, bridge in the Party Room, Towers Building, 3rd floor. Bridge following lunch from the menu at Benvenuto’s Italian Grill (part of Holiday Inn), 1109 Fourier Drive, Madison. All levels of players welcome. Meet at a restaurant for dinner, followed by dessert at home of host—or meet for an occasional brunch. Members enjoy good food and good company and take turns planning lunch at area restaurants. General French conversation; use selected readings as basis for discussion. Meet in members’ homes and/or libraries. Members meet monthly for light refreshments and to engage in general conversation in French. Meetings are held in members’ homes or at public libraries. Selected readings may be used. Share experiences and hear guest speakers. No experience necessary to join this group. May meeting is 6:00 pm potluck dinner. We are a well organized dinner club that makes it possible to have wonderful and unique dinner parties in our homes. The recipes are creative, tested and easy to prepare. Conversation flows freely making these Sunday night dinners fun. Play the American version of Mah Jongg, an ancient Chinese game using tiles. 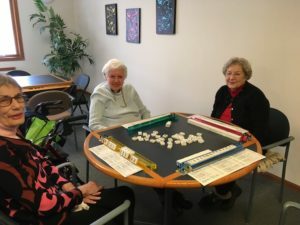 We meet in the game room of the apartment/office building of Coventry Village Retirement Campus, located just off South High Point Road. New and experienced players are welcome, as well as those who wish to learn the game. Join friends once a month to view and discuss new movies at local theaters. Times and meeting locations will vary depending on movie schedules. Singles and couples welcome. Meetings are held at Oakwood West. NOTE: The initial October meeting is held on Sunday at Church of the Living Christ on Gammon Road with the Embroiders Guild. Members do various types of needlework, exchange ideas, have guest speakers, workshops, and trips to needlework stitchery shops. Informal group where members share experiences, conversation and reading of short articles. Meetings held monthly, year round in Sequoya Library. New participants are encouraged to attend. Reading and conversation include works by contemporary authors from Spanish speaking world. Members also share cultural activities and personal experiences. Meetings are held September through May at the Sequoya Library. New participants are encouraged to attend. Are you on a first-name basis with any Super Tuscans? Have you tried the wines of Lake County, California? Wine Divas & Dudes offers the opportunity to taste new and different wines while enjoying lively conversation. Each meeting centers on a wine theme, usually with appetizers. One of several members volunteer to host a meeting, selecting the theme. At each meeting, each attendee contributes $15 to help defray costs. (Note: November and December are combined into a single meeting).